GUILLAUME BIJL (° 1946, Antwerp) is a self-taught artist. He attended a theatre course and worked successively as a stage builder and painter. From the second half of the seventies he abandoned painting and started making tragi-comedic installations, sculptures and compositions inspired by the banality of our consumption-driven society. By presenting entire stores, gym schools, dog groomers, tourist sites… as art installations, the audience is confronted with the structures and institutions that form our world, our identity as a people. Bijl aims to expose consumers’, citizens’, tourists’, even art enthusiasts’ blind acceptation of suggested realities by inflating the artificiality of everyday situations. The expected border between art and life becomes highly distorted. In his compositions he brings together found kitsch and cheap objects and showcases them as if they were relics of our times, preserved for the future as priceless treasures, emphasizing the absurd bond people tend to have with material objects. Combining unapologetic criticism with loads of humor, the spectator is offered a loud dose of Guillaume Bijl that’s hard to ignore. 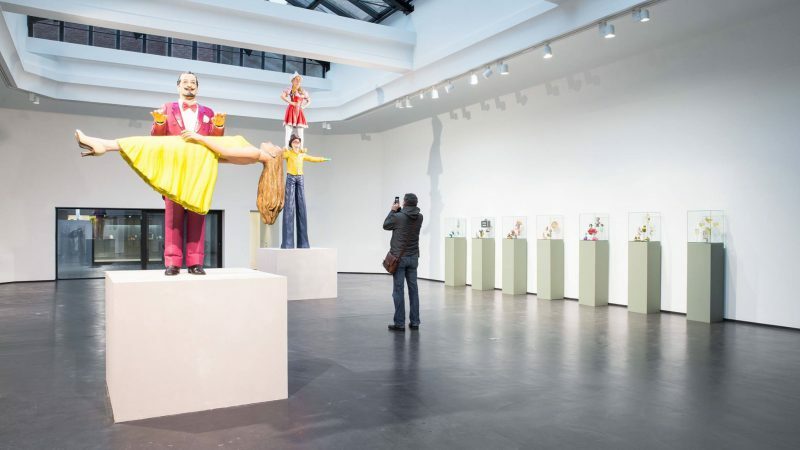 Bijl was invited to participate in Documenta IX in Kassel in 1992 with his Documenta Wax Museum, and from 2001 to 2011 he was professor of sculpture at the Münster Art Academy in Münster, succeeding Joachim Bandau. He participated in the Skulptur event in 2007.Projekte 2007 in Münster. He received retrospective exhibitions in Belgium at the MUHKA in Antwerp and the SMAK in Ghent. He has exhibited abroad at TATE Liverpool, Arken Museum Copenhagen, Witte de With Rotterdam and many other museums. In 2016, Guillaume Bijl participated in Manifesta 11 in Zurich with the installation Hundesalon Bobby. Celebration of the 20th anniversary of the famous Belgian artist society.